In this chapter, you will learn about the various types of remotely sensed data and remote sensor systems used in remote sensing. The information will help you understand the uses of remote sensing such as monitoring cropland, forests for fires, wetlands, and floods. You will learn about the history of remote sensing as well as where the industry is today and where it is going in the future. This lesson provides information on the elements and strategies of visual interpretation and digital image processing. An overview of ArcGIS is included in this lesson to help you gain a better understanding of this software used for remote sensing. List different types of remotely sensed data and sensor systems. Describe various types of remote sensing systems and their applications. Describe the history and future trend applications of remote sensing. Because of the nature of remote sensing, there are several useful applications and uses of this form of spatial data. Remote sensing can acquire data from poorly accessible and inaccessible regions. Also, because of the types of sensors remote sensing uses, there is a wide spectral range of information that allows for the collection of data in non-visible wavelengths such as infrared. Remote sensing devices such as satellites can acquire regional to global scale information relatively quick to determine change patterns spatially and temporally. ​Consider how remote sensing relates to other pieces of mapping technology such as geographic information systems (GIS). The figure above illustrates how remote sensing refers to the other parts of GIS and mapping. Remote sensing includes digital image processing, image acquisition, and photogrammetry, which is the science and processing of making highly refined corrections to aerial photos. Remote sensing technology also connects with GIS when an analyst needs to make maps, conduct spatial analyses, and perform geoprocessing actions. The sensors used to collect remote imagery often operate on satellites, aircrafts, balloons, unmanned aerial vehicles (aka drones), and more. Remotely sensed data is often used as a background or as inputs to the geoprocessing functions within the GIS software. The technology also connects with global positioning systems (GPS) because the imagery can be utilized as a background in the GPS unit and provides a visual context when a person is using a GPS unit for data collection or navigation. Remote sensing connects with Internet mapping because again, the imagery can be used as a background and served up as a web map service. This can be used on web or mobile applications and provide visual context for these applications when they are used for navigation, routing, or for displaying other spatial data such as points of interest, traffic flow, areas of impact, and more. So as it can be seen, rmote sensing is an integral part of all aspects of spatial-based and location-based information and geospatial technology. The following are examples of some of the uses of remotely sensed imagery and how this data can be incorporated into other applications. The map on the lower left is an example of cropland monitoring. This is a public website maintained by the USDA called CropScapes which is a web-based application that shows different types of crops that are grown throughout the United States. This data is updated annually and is derived from the MODIS and Landsat satellites. The general public and scientists can use this site to review, download data, and look at crop changes over time for different parts of the country and to do analysis on this information as needed. Remotely sensed imagery can be used for forest and fire monitoring. As can be seen in the image on the lower right, there are two large active fires burning. You can see the active fires burning as well as the area that has burned and the smoke plumes that are coming off the fires. In addition you will notice that there are clouds in the image. This image was taken from a Landsat 7 satellite in June 2002 in an area of Arizona. Since the Landsat satellite orbits in space the satellite not only picks up the fires and the smoke, but also picks up the clouds that are in scene. Figure 3 is from the US Forest Service of the Rodeo and Chedeski Fires in Arizona from Landsat 7, June 21, 2002. ​The image on the lower left is an example of how remote sensing can be used to monitor mining operations with geospatial technologies such as unmanned aerial vehicles (aka, drones) to fly around a mining site to monitor the mining operations. 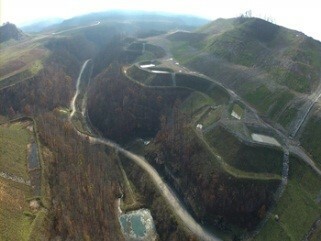 The image happens to be a surface mine in West Virginia. In this case the USGS is flying the UAV mission to collect imagery and information for the mining operation. The image on the lower right is an example of different kinds of wetlands that have been identified using satellite radar imagery. The map is a section of a large wetland in Alaska that has been categorized into different wetland types. 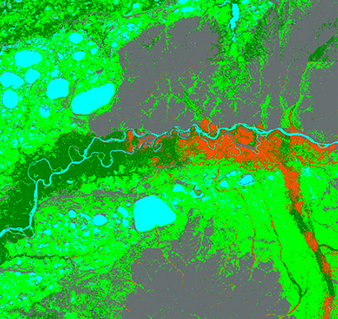 This screenshot represents a small web-based mapping application created by Jet Propulsion Laboratory that shows the wetland mapped in Alaska. ​The two images on the lower-left are examples of how remotely sensed imagery can be used for flood monitoring. 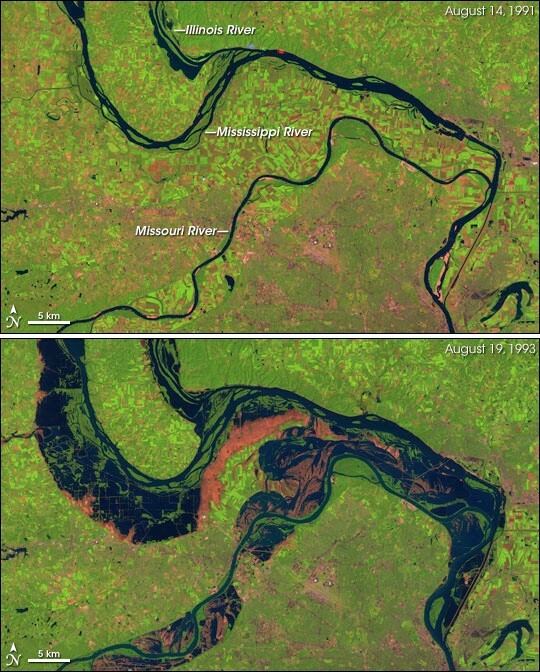 The top image shows the Mississippi River in a pre-flood event and then the image on the bottom shows the Mississippi River after a major flood that occurred in 1993. You can see how extensive the flood was in both Mississippi and Missouri rivers. This imagery and the maps derived from them were used to process insurance claims of affected property owners. The image on the lower right illustrates how remotely sensed imagery can be used to monitor ice conditions. 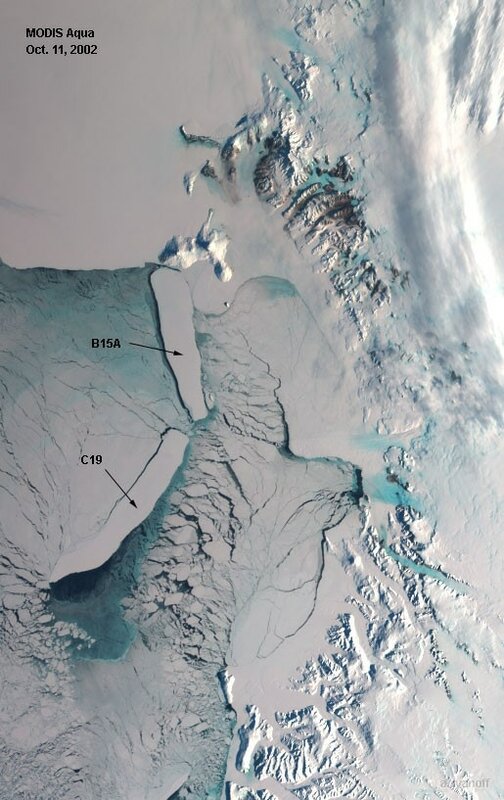 This image was taken by MODIS satellite in 2002 and in the center of the image there are two large icebergs near Antarctica. Remote sensing has also been used to monitor the Arctic and Antarctic sea ice freezing and thawing and the changing conditions of ice and snow as a result of climate change. 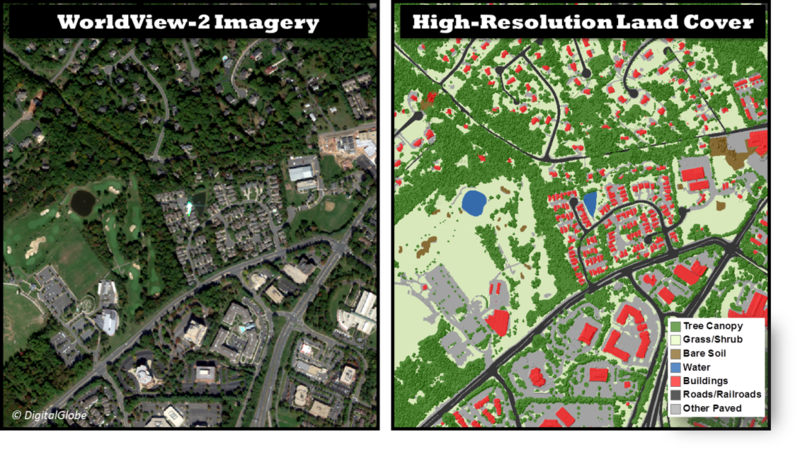 Feature-based mapping or object-based image classification is a digital image processing technique that can be used to identify specific kinds of objects in high-resolution imagery. The image shown on the left represents a high-resolution satellite called Worldview-2. 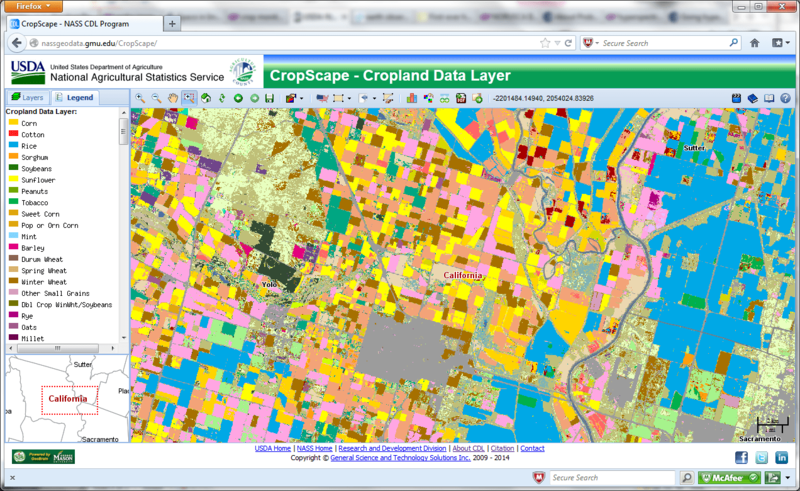 On the right, the picture shows the mapped land cover and land use types that were categorized using feature-based mapping methods. Visible are trees, shrubs, soil, buildings, roads, and other paved surfaces that have been identified in this image. Remote sensing has been around almost as long as photography itself. Chemical photography on a permanent medium has been around since the 1820’s. 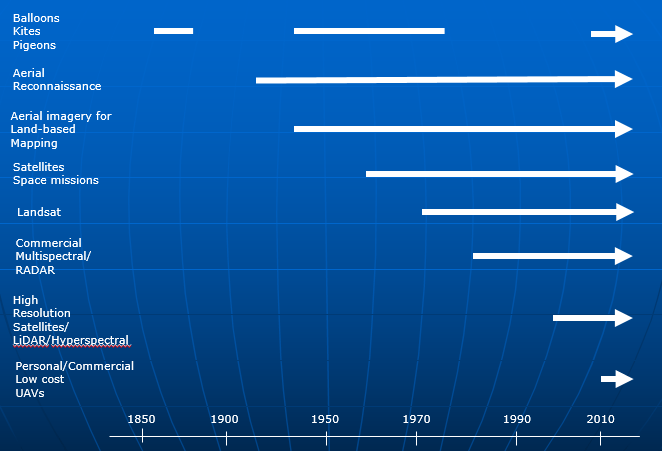 Figure 9 shows some of the major milestones of remote sensing over the last 150 years. 1903: With the advent of modern flight, remote sensing was used in World War I on reconnaissance flights to “see” where the various military posts were located. Since then aerial photography or aerial imaging is a standard practice for military purposes. 1940’s – Present: After the 1930s and 40s, aerial photography has been used to map and monitor natural resources such as agricultural lands, urban development, and changes in the natural environment. 1950’s -1960’s: During the development of the “Space Race” in the 1950s and 60s satellites were placed in orbit to test capabilities of communication and space flight. 1972: In 1972, the first satellite called the Earth Resource Technology Satellite (ERTS), and later renamed to Landsat-1, was put into orbit to monitor the Earth. Since then a number of government-sponsored and private companies have placed Earth monitoring satellites into orbit. In February of 2013, the Landsat program marked its 40th anniversary with the launch of Landsat 8. 1980’s –Present: In the mid-1980s the US and other countries placed a variety of remote sensing satellites into space that includes both multi-spectral and RADAR sensors. 1990’s – Present: In the 1990s to the present day, aerial and space-based remote sensors have improved both the spectral and spatial resolutions. Some sensors such as Hyperspectral sensors can have over 200 unique spectral bands. Many airborne imaging systems can image with a ground resolution size of fewer than 3 inches, while commercial space-based imaging systems can capture image data in multiple wavelengths with a ground resolution of less than 1m. Also during this time, the development of LiDAR systems, sensors that capture high-resolution elevation measurements using laser technology was also developed. 2010 – Present: In more recent and likely future times, the number and variety of satellite systems will continue to improve in both spectral and spatial resolution capabilities. In addition, the use of unmanned aerial vehicles (UAVs) and open source software have started to become popular and cost-effective for individuals and communities to capture, process, and use imagery from these systems as well as open new markets to offer new products and services that have in the past been cost prohibitive to develop and implement. Also, it is suspected that standards and regulations will be created and adopted by governments and agencies so that UAVs can be properly used for specific applications and balance the utility of such systems with privacy and “spying” issues. The image below is a timeline of the approximate history of the various technologies just mentioned. All of the different remote sensing systems have been in continuous operation since their inceptions are listed. The Balloon, kite, and “bird” options have had some sporadic history with some breaks here and there. Once motorized flight became common, the “low tech” options faded. ​During the 40s to 60s, balloons were used in part to develop weather-predicting technology as well as test photographic systems that were the precursors to “space” photography and the modern Earth imaging systems. In recent times digital photography has become more common place with high-quality resolutions. The ability to mount and use low cost infrared digital imaging systems such as the kite and balloon mounted options have experienced a resurgence of interest and provide some opportunities for the “Do-It-Yourself” hobbyist to capture, process, and use “high tech” imaging systems. This was once limited to those with formal education and training in digital imaging systems and digital image processing techniques. Figure 15 includes some examples of current unmanned aerial vehicles include “copters,” kites, fixed wing remote controlled airplanes, and balloons. Many of these are low cost, (less than a couple of thousand dollars), and can have various digital camera systems mounted on them and typically include true color can color infrared imaging systems. Many are also programmed for flight and the imagery processed with open source software. Part of remote sensing is to capture and process imagery. Later chapters will focus on the image processing aspects. One primary element of remote sensing is interpreting the imagery or the results of digital image processing routines. This is an essential skill that image analysts develop and requires an understanding of the information collected by the sensor as well as the concepts and methods used to process the image data. In addition to understanding the information gathered by the sensor and analyzing the imagery, it is also helpful for the image analyst to have knowledge of the geographic area. The analyst may not always work or live in the area that the imagery was taken, so obtaining a background on the geography or learning about the kinds of features one would expect is often helpful. Analysts may also need to look at a variety of information sources that may include images and secondary data sets from past projects in the same area, review sensor characteristics and image processing methods that could be used to process the image. It is also common that the image quality may not always be adequate to interpret objects visually. Some issues that affect visual interpretation are haze, smoke, cloud cover, shadows from clouds, buildings, or other landscape features such as tree canopy or mountains. Visual interpretation also often takes a lot of patience and imagination and be able to tie concepts of how the sensor collects spectral information to the pixels in the image that represent the geographic features. Some common elements for performing image interpretation are as follows. Several of these elements are often used in any visual interpretation exercise and for any given type of imagery. Tone – refers to the relative brightness of an object for a given a color or black and white display. The analyst would expect the building to appear bright in a true color image if the buildings are in an urban setting. Dark tones would be expected for the same urban areas when the image analyst is looking at an image that contains spectral information from a color infrared imaging sensor. Texture – refers to the spatial pattern of tone or color. Texture can play an important role in interpreting geographic objects in imagery. Some features will appear with a regular spacing of similarly colored or bright pixels; whereas others will tend to have a random pattern of pixels. For example, rows of corn in an image may have a regularly spaced set of bright pixels representing the corn and dark pixels representing the soil in between the corn rows. A wetland may have a random appearance of both dark and bright pixels. Shadows – shadows can assist the analyst to interpret features in the image. For example, shadows cast by palm trees may help to explain palm trees visually. Site – the “site” of an object refers to its expected placement of this object based on the topography or geography that it is expected to be in. For example, certain kinds of trees grow at certain elevations or one would expect no trees above a certain altitude because some trees cannot grow above this elevation. Association – refers to the placement of an object relative to other features. For example, wetlands might be expected to be found near rivers, streams, or creeks. Resolution – the image resolution limits the kinds of features an image analyst can interpret. For example, if an image has a 30m pixel resolution, it is likely not possible to identify individual buildings or houses. Whereas, in a high-resolution image with 6in pixels, the details of houses and buildings can be determined (such as windows, gables, and vents). Some of the general interpretation strategies that image analysts tend to use in any visual interpretation exercise are explained here. Direct observation refers to actually “looking at” the imagery and interpreting the object and being able to identify it. For example, the feature I look at on an urban image is a high-rise office building. Inference of an object involves an image analyst who can infer what the object is in the image by looking at surrounding geography and other nearby objects. For example, a particular kind of forest plant community can be inferred by its presence on a specific facing slope (such as south-facing) of a hill. It is often helpful to have knowledge of the local geography when working on a remote sensing project. If the analyst does not live or work in the local area, then he or she may need to visit the area, talk to others who live or work there and obtain and study other reference documents and information on the geography. Reference material tends to include various kinds of digital or paper information that can include maps, image classifications of land cover, stream and river networks, wetland maps, urban infrastructure, and acquiring digital geographic reference information such as streets, lake boundaries, forest stand information, trails, etc. In this chapter, you learned about the various types of remotely sensed data and remote sensor systems used in remote sensing. The information helped you understand the uses of remote sensing such as monitoring cropland, forests for fires, wetlands, and floods. You learned about the history of remote sensing as well as where the industry is today and where it is going in the future. This lesson provided information on the elements and strategies of visual interpretation and digital image processing. An overview of ArcGIS was included in this lesson to help you gain a better understanding this software used for remote sensing.